This is a WSJ debut for Sande Milton although this pair has teamed up twice before in the NYT. The first thing you notice about the grid is the giant squarish U in the center. The grid is rotationally symmetric, except when it comes to the U. Obviously it’s thematic in some way. How so? 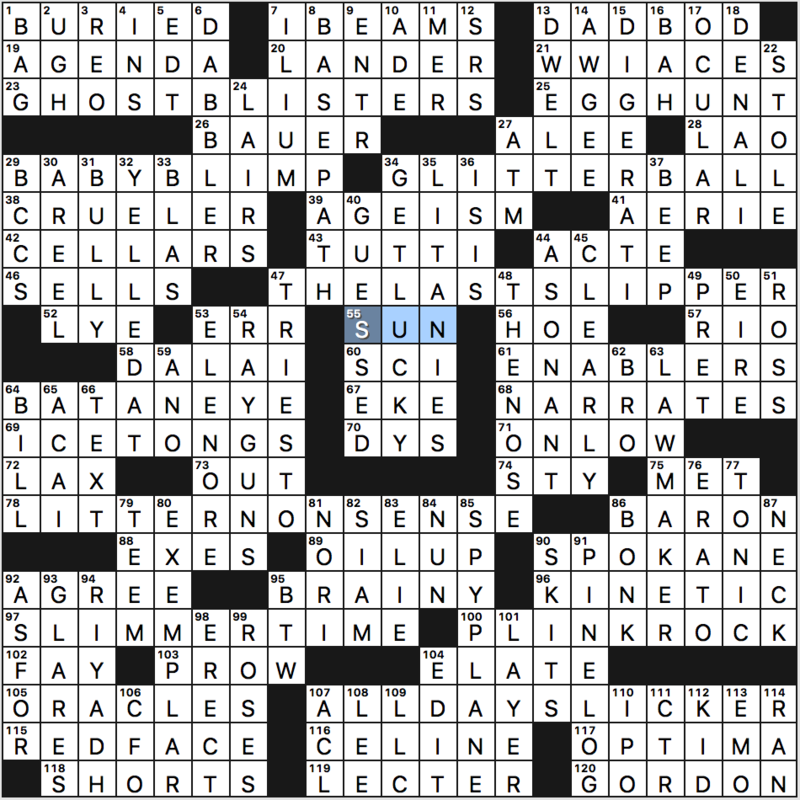 Our theme answers all would normally have a U in them, but for our puzzling fun, every U has become an LI. 23a [Occupational hazards for phantoms?] GHOST BLISTERS. Ghostbusters. Hmm. I don’t know about this one. I think you would need to generate friction in order to create a blister, and based on years of research (watching movies), I’ve concluded that ghosts can’t generate friction. But maybe I’m being wraithist. I mean, how do we really know what hardships a ghost has to contend with? 29a [Scaled-down airship?] BABY BLIMP. Baby bump. Super cute, this one. 34a [Gala for fashionistas?] GLITTER BALL. Gutter ball. Being a stay-at-home dad to two daughters, I don’t tend to get along with glitter. That being said, this sounds like a fun time. 47a [Plot device in the Cinderella story?] THE LAST SLIPPER. The Last Supper. Nice one. 78a [Horseplay from newborn puppies?] LITTER NONSENSE. Utter nonsense. Awww! Who’s a good puppy! 97a [Utopian future for dieters?] SLIMMER TIME. Summertime. 100a [Genre for Little Richard on a toy piano?] PLINK ROCK. Punk rock. I can easily imagine Little Richard on a toy piano. 107a [Round-the-clock raincoat?] ALL-DAY SLICKER. All-day sucker. I’d rather have the sucker. These were a lot of fun; I enjoyed almost all of them. 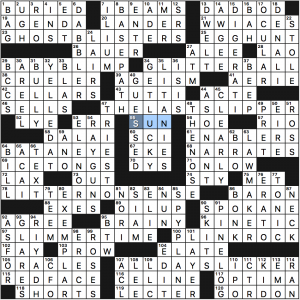 And notice there are no extraneous U’s in the theme answers. That’s not by accident. And the central U makes for a surprisingly effective hint. 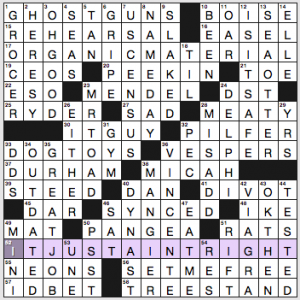 The other thing that made this grid a winner is its cleanliness and fun fill. I’m liking GET LUCKY (clued cleanly as [Beat the odds]), BASE PATH (clued cleverly as [It leads to home]), DIGERATI, ENABLERS, BAT AN EYE, ICE TONGS, EGG HUNT, KINETIC, LAWMAKER, EXEMPLAR, RAY GUNS, and SPY PLANE. There are a few things like NORI and ILIUM to keep you on your toes, but for the most part, I really loved the fill here. 13a [Paul Rudd’s physique, e.g.]. DAD BOD. Ha! I filled this in without a crossing, but was doubtful the puzzle would go there. It went there. 21a [Manfred von Richthofen and Eddie Rickenbacker, e.g.]. WWI ACES, and 86a [Business tycoon] BARON. Curious that the latter word was not clued with respect to Manfred von Richthofen, a.k.a. The Red BARON. 48d [El Capitan climbing route that resembles a human feature]. THE NOSE. I didn’t know about this, but then Jeff does do some climbing. 87d [One might end up in a tie]. NECK. Cute. 112d [A little butter?]. KID. Another cute clue. This one is caprine. Thoroughly entertaining theme and puzzle. Four stars from me. I like this puzzle. There are some boring bits, but lots of interest, too. “IT JUST AIN’T RIGHT” resonates with me and I don’t speak in a Southern patois. ORGANIC MATERIAL is livened up by the clue’s Mars angle. DOG TOYS is cute, and VESPERS is a pretty word (it fills the slot of yesterday’s GLISSANDI in my “ooh, pretty!” category). I like “OH, GOOD!” and “GREAT JOB!” and “OK THEN!” Also nice: SEA OTTER, MR. TOAD of Wild Ride fame, NAME DAY, the U.S. CENSUS. Did not know: 1a. [Firearms without serial numbers], GHOST GUNS. I know the concept, but not the term. Unwanted sexism: 30a. [He works with bugs], I.T. GUY. “I.T. guy” is innately sexist, suggesting that I.T. professionals are male. The clue doesn’t say it’s anyone, just a “he,” but the answer phrase itself is problematic and the English language has far too many such terms. This is the spot where I usually embark upon a bulleted list with some more clues, but I have had a week and I’m going to sign off. Four stars from me. THEME: Apt spoken phrases for people in a certain profession- clued as introductions. I really enjoyed the playfulness of this puzzle, but I must confess that I’m lost as to how/why these phrases are considered “introductions.” HERE’S THE DEAL seems like the only phrase of the bunch that sounds introductory in a sense. I can’t imagine someone saying IT’S A PIECE OF CAKE to begin a conversation. Wouldn’t the “IT” have to be established first? Perhaps I’m missing something. 30A [Natick, to Boston] SUBURB. 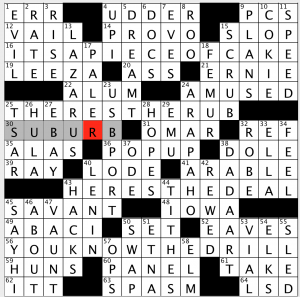 Constant solvers will catch the wink in the clue, of course. 15A [Feast for a pig] SLOP. Anyone else plop in LUAU? Ha! No. That’s a feast with a pig. 38A [Some Duchamp works] DADA ART. Looks very funky in a grid. I like it. 26D [Dance that can be done sitting] HULA. Huh. Didn’t know that. I’m pretty sure HULA hooping would be tricky in a sitting pose, though. Little bit of a clue/answer dupe with 27D [Site with seller ratings] and 2D [Assign stars to] RATE. I’m interested to know if anyone else was somewhat confused by the phrases being clued as introductions. I still have not met this constructor, and sometimes after attending the ACPT, and the subsequent flurry of Facebook friend additions, I feel like I should know each and every constructor personally! I do feel it is an honor and a privilege that I DO know so very many of this unique group of people. Smooth solve for this one, which is great after a brain wrenching tournament last weekend. I think I may have to start solving more downs-only puzzles to make a leap in the standings. And maybe drink more coffee! I’ll stop rambling now; and I will end with the thought that I hope to meet Pawel someday! 4.5 stars. 17A [Makes a pig of oneself] ENGORGES – The mental pictures invoked here are of someone attacking a buffet or a large plate of food. And they are making me hungry! 32A [Dish-washing liquid] TAP WATER – H0w is the tap water for drinking where you are? Ours isn’t bad. 55A [French actress Adjani with a record five César Awards] ISABELLE – I think I have heard of her before, but I don’t know a single film that Imdb lists that she was in. Mainly because they are from decades ago and most all are in French. I think the César is the equivalent in France of an Oscar. 4D [__ Nowitzki, 21-season NBAer] DIRK – This is his last season. A total class act. I have enjoyed watching him play over the years. 8D [Rock samples?] DEMO TAPES – Great clue, possibly the best of the bunch. 23D [Exercise equipment sometimes swung] KETTLE BELLS – I went to a gym a few years ago that used these. Great training tool. I should exercise. 42D [Friend of Richie, Ralph and the Fonz] POTSIE – I haven’t seen this show in a million Sundays, but I watched it so much when I was a kid that this was a quick gimme. 51D [__ Upton, co-founder of the U.K.’s Raspberry Pi Foundation] EBEN – Who? And founder of what?? 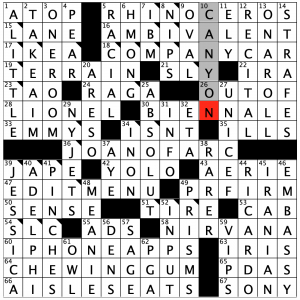 I believe this is the first Newsday puzzle by this “constructor,” but if you look closely you will see that this is a pseudonym of two well known constructors: Erik AGARD and Doug PETERSON, both fellow Fiend members! Excellent anagram work, and the name sounds quite cosmopolitan! This could be the name of that Dos Equis guy you see in memes all the time! Please try to ignore all of the error marks in the grid image, but I will admit that is hard to do! This puzzle gave me all kinds of fits, but it is likely due to post ACPT-delirium. I am just now recovering from the lack of sleep and jet travel. It is a lame excuse, but that is my story and I am sticking to it! My ineptness aside, this is a quality puzzle by two pros of the biz. Clues are rife with misdirection. 4.8 stars. 16A [Semi-pro] AMBIVALENT – As a theme of the misdirection, the word “pro” here is used trickily. I don’t know how to get better at this type of clue. But it is an excellent clue nonetheless. 28A [Joshua __ Cowen (model train mogul)] LIONEL – I suppose one would slap their forehead after getting this, but who know it was his MIDDLE name? 36A [Title character for Schiller and Shaw] JOAN OF ARC – I believe you. 49A [Spinning thing] P.R. FIRM – Again with the misdirection. THAT type of spin! 50A [One of Spider-Man’s six] SENSE – Pretty sure the sixth sense is his “spidey” sense, that comes into play in virtually every one of his movies and cartoon shows. 64A [Source of some fruity pops] CHEWING GUM – The misdirection here is pop. This clue and answer combo might be the best of the bunch. 44D [Ball part] RICARDO – Ball as in Lucille Ball. Also excellent. 46D [Mission away from home] EMBASSY – So the Alamo was an embassy?? This entry was posted in Daily Puzzles and tagged Debbie Ellerin, Ernesto G. Prada, Greg Johnson, Jeff Chen, Pawel Fludzinski, Sande Milton. Bookmark the permalink. Amused by the Paul Rudd/DAD BOD cluing, only because I think (having seen him in 3 Marvel movies as Ant-Man) he is not in stereotypical dad bod shape. 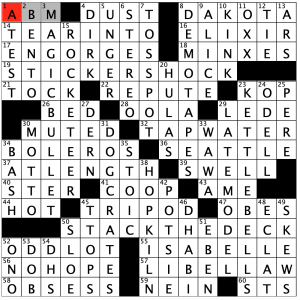 Loved the semi-pro clue in the Stumper. Pretty surprised with the SEAS / SEA OTTER dupe in the NYT this morning, and the less I think about unregistered firearms the better. NYT: Somehow,” ORGANIC Matter” sounds better to my ear than ORGANIC MATERIAL, although I realize both are legit. It took me forever to come up with the M at the start of MENDEL- I felt like a “Pea brain” myself. As to the existence of GHOST GUNS, well ‘IT JUST AIN’T RIGHT”. The EAT ME / SET ME FREE dupe AND cross in the NYT was the one that I found unbelievable. ITSAPIECEOFCAKE got a chuckle out of me, but I’d have to agree that it’s less an introduction and more an explanatory phrase. I pictured a baker having to spell out their work for a clueless audience. LAT 24D used to play for that team but was traded on March 12, 2019. “Maybe I’m being wraithist” is one of the better lines ever to appear on this site. LAT: Not that it distracted from the solve, but interesting to see ODELL clued to the New York Giants, who traded him away on 3/12. I have no sense of how close to publish date an editor can make changes. The Alamo was one kind of (religious) mission; the word is also synonymous with “embassy”. Excellent Newsday. I had to set it aside last night, muttering “remember Snapple” as I fell asleep, which of course didn’t fit 25D at all. But I finished it with no consultations with Dr. Google, except to verify IKEA’s play place. I once had a COMPANY CAR, so that helped in the NE. Isn’t the Schiller play “The Maid of Orleans”? Well, I guess Joan of Arc is still the title character, so never mind. I have a different point of view about terms like this. I don’t really see them as innately sexist, rather, I see the English language as an ever-changing, fluid entity – with the meanings of words changing with attitudes and usage. “Guys” is a term that has evolved over my lifetime to be far more gender-neutral in usage than it is gender-specific. …could have been male or female – and regardless of who was being addressed, a group of all-females, all-males, or a mix of both. 35 years later, when my kids were in college, the usage continued to be far more commonly gender-neutral – and that trend continues today. I now teach in a very high-tech area of a university, and the term “IT Guys” is used commonly by both male and female students and professors alike; and the “IT Guys” are made up of both male and female technicians, and just like when I was in school, they self-refer using that term. We live in an age where “bad” has come to mean “good” in colloquial usage. “Queer” used to be a highly offensive word, but now it has been embraced and is now worn with pride – added to the self-referential “LGBTQ” identity, and is the first word in the widely accepted “QUILTBAG”. The meaning of words evolves – and “guys” is smack in the middle of that evolution. If we can let common usage dictate, and if we can let those who are part of the change accept it as they seem to have been doing over the last 30 years, then maybe in a few years the next generation will be completely unaware that a word like “guys” ever referred to men only.